MAKO™ Lake and Pond Dye is the ultimate professional colorant, and can be used year round to enhance and beautify your lake or pond. 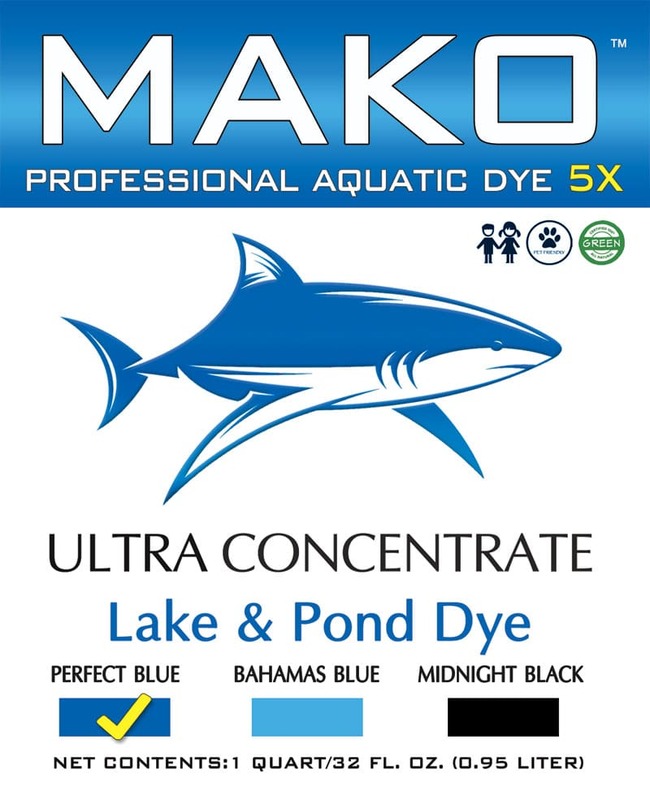 Maximum concentrate MAKO™ works faster and lasts longer in most all contained bodies of water. MAKO™ reduces sunlight penetration by blocking a broad spectrum of UV rays and is 100% Safe around people, livestock, birds, pets, horses, fish, wildlife and the environment. Water treated with MAKO™ may be used for recreation, fishing and other activities immediately after treatment. 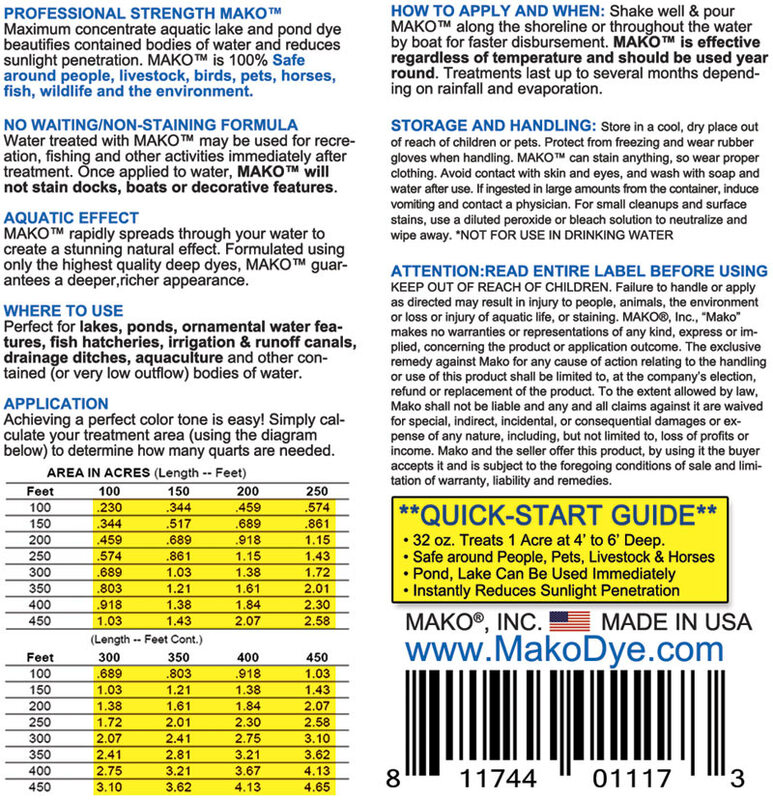 Once applied to water, MAKO™ will not stain docks, boats or decorative features. AQUATIC EFFECT MAKO™ rapidly spreads through your water to create a stunning natural effect. Formulated using only the highest quality deep dyes, MAKO™ guarantees a deeper,richer appearance. WHERE TO USE Perfect for lakes, ponds, ornamental water features, fish hatcheries, irrigation & runoff canals, drainage ditches, aquaculture and other contained (or very low outflow) bodies of water. Shake well & pour MAKO™ along the shoreline or throughout the water by boat for faster disbursement. MAKO™ is effective regardless of temperature and should be used year round. Treatments last up to several months depending on rainfall and evaporation. Looking For a Rapid Aquatic Contact Killer to Compliment Your MAKO Experience? Sonar Genesis contains a powerful ingredient ‘fluridone’ which will completely eradicate most nuisance pond weeds when used as directed. It is the premier go-to product for pond applicators worldwide and is manufactured by the leading US based aquatic control company SePRO. Reward herbicide is super-fast acting weed killer, which works best on submersed weeds, especially effective on as a quick knockdown killer for Elodea, Eurasian Watermilfoil, Coontail and Duckweed and Algae. Recommended highly for ponds and along lakeshore areas and for spot treatment. This weed control product is absorbed by target plants in just minutes with no toxicity to fish or wildlife. No Swimming Restriction. NT-MAX Lake & Pond Digester An Industrial Strength Biological Water Clarifier & Digester Eliminates Excess Sludge & Nutrients to Completely Restore Your Lake, Pond or Lagoon to Crystal Clear Condition. This Biological Bacterial treatment contains Billions of bacteria that double in numbers every 30 minutes to absorb and digest sludge and nutrients while reducing excessive fuel. Mako Lake and Pond Dye Copyright © 2019.